Lake City, FL – The Rockstar Energy Wakeskate Tour proved its ingenuity and stability with a brand-new contest set up and an incredible line-up of athletes at the first annual Suwannee Pro. Suwannee Pro, located on Nick Taylor’s wakeskate dreamland, presented an ideal territory for camping and festivities for riders and spectators as the much larger-than-usual setup surrounded by Florida’s sprawling oak trees and complemented with aquamarine-colored water made it a fun environment for local families to enjoy the competition as much as the riders did. Suwannee Pro’s setup changed the game in the qualifying rounds and brought a few fresh faces to quarterfinals and the overall competition. Heavy rainstorms altered the playing field during semifinals, but it certainly didn’t prohibit riders from throwing consistent hammers throughout the competition. After 6 heated quarterfinal rounds and two rounds of semis that were nothing less than unforgettable we found ourselves in one of the heaviest finals heats ever with Dieter Humpsch, Nick Taylor, Austin Pastura, Ben Horan, Andrew Pastura and Daniel Grant. This is the second event with the new finals format and it once again proved successful. Although the two drops were exceptionally large the riders found no trouble. One can see the persistence it takes to make things perfect and in the end Nick Taylor proved he was not going to be beat at home. He rode the entire round with such flawlessness and consistency making it clear to see that Nick Taylor is one if the best this sport has ever seen! His switch frontside flip / frontside flip was one for the record books. Even to get it perfect he landed multiple switch frontside flips just to get it right. When it was finally landed "perfectly" you could see this was his victory. Andrew Pastura, who because of his second place finish, pulled him into the lead for this year’s tour and Austin Pastura rounded out the podium in third. It truly was an event to remember. It was all about style in the Women’s event. The seven riders battled it out on one of the tallest gaps yet this season creating a unique competition for the ladies. In the end, their approach was the same with each rider landing a pop-shuv down the gap requiring the judge’s to base their decisions strictly on style and execution. Jen Gilanfarr kept it clean and precise landing her in first place, her second individual event title this season. 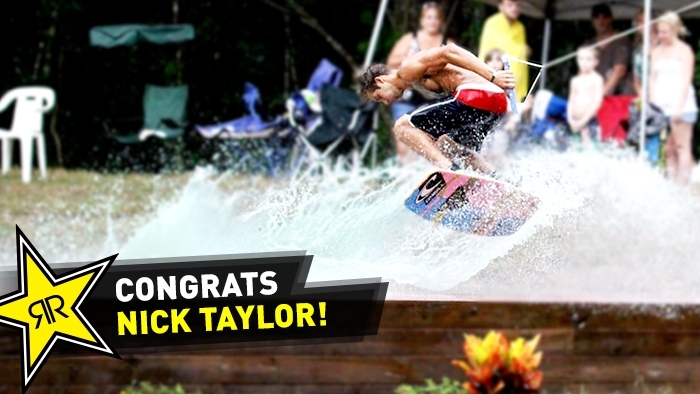 As The Wakeskate Tour goes on it just seems event after event we see the best riding the sport has ever seen! We want to thank our sponsors - Rockstar Energy, Remote, Nike, Zeal Optics, and Sesitec 2.0 for making this tour happen. A special thanks goes out to everyone who made the Suwannee Pro site. It is an amazing addition to wakeskating!